In 1916, the parish was established as SS. Peter and Paul Russian Orthodox Church. In the early 1930's due to economic realities, the faithful of SS. Peter and Paul lost their building, and were forced to move. In January of 1943, the present Church structure and parish home were regained by the faithful of SS. Peter and Paul Russian Orthodox Church and in keeping with tradition, the Church was renamed in honor of the Theotokos. In early spring of 1943, Archimandrite Seraphim (Oblinantseff) was appointed as first pastor of St Mary's Russian Orthodox Church. Archimandrite Seraphim wrote most of the Icons in the Church's Iconostasis, and oversaw the completion of the Iconostasis. His pastoral labor lasted twelve years, and on December 13, 1954, he fell asleep in the Lord. On March 9, 1955, St Mary's received her second pastor, Fr John Waschak. During Fr John's pastorate, the Church was renovated, a permanent Sunday school program was initiated, and St Mary's prospered. In 1966 a new Altar table was consecrated by Metropolitan Ireney, and Fr John was elevated to the dignity of Archpriest. Under Fr. 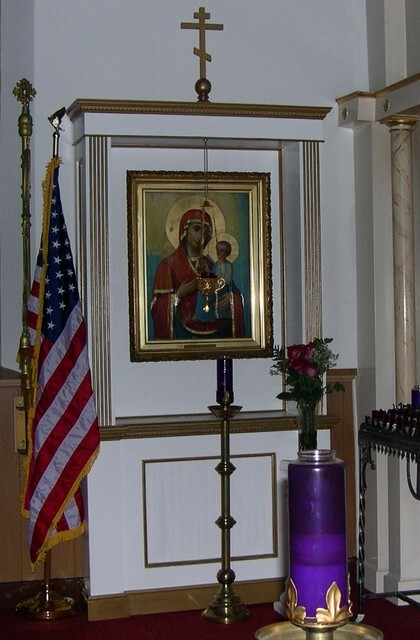 John's pastorate, many things were accomplished, a new ceiling was installed in the Church, a new chandelier from Greece was installed and Icons of the American saints, Herman and Innocent, were added to the Iconostasis. In 1970, St. Mary's adopted the English language for liturgical use, and in 1980, adopted the Revised Julian Calendar. In 1996, a time of transition for the parish began with the increasing illness of Fr. Waschak. In February of 1996, Basil Rex Carpenter was ordained to the diaconate in the parish and was chosen by parish upon the recommendation of Archbishop Kyrill to become the new parish priest. On Bright Saturday, April 20, 1996, Deacon Basil Carpenter was ordained to the Holy Priesthood in Holy Assumption of St Mary Church and returned to St Tikhon's Seminary to finish his studies. On May 11, 1996, Archpriest John Waschak fell asleep in the Lord. On June 29, 1996, Holy Assumption of St Mary Orthodox Church formally received her third pastor, Fr Basil Carpenter. Sine June 29, 1996, St. Mary Russian Orthodox Church has been growing, and the faithful have continued to be steadfast in the apostolic labor of bearing witness to the Orthodox Faith. Ten years ago, the parish began the complete restoration of the Church edifice, with the cleaning and pointing of the Church building, installation of new three bar crosses, new main doors and a new sign installed on the building. New Analogion Icons of the "Dormition of Theotokos," "She Who is Quick to Hear," and "Christ, the Giver of Life" have been added to the Church as well as two icons of the guardians of the portal on the stairwells entering the Church, and a great Icon of the Theotokos over the main altar. On November 19, 2003, another milestone was seen by the faithful of St. Mary Orthodox Church with the monastic tonsure of their parish priest in the parish. Fr. Basil Carpenter was tonsured a hieromonk by Archbishop KYRILL and given the name Patrick. With the tonsuring of Hieromonk Patrick a new dynamic was received by the parish to seek to accommodate daily monastic services as well as normal parish life. In the last decade, our parish has been blessed with three seminarians - with one, Joseph Lucas having been ordained to the holy priesthood by Archbishop MELCHISEDEK, and one other parishioner - Evgeni Peykov - ordained to the holy diaconate and now to the holy priesthood (Sunday, April 11, 2010) by Archbishop MELCHISEDEK. This glorious fruit of laborers is the direct result of the faithfulness of the faithful of this parish and the pastoral ministry of the priests of this Church. In September of 2010, the St. Cyril of White Lake Food Pantry was opened in our Church Hall to help feed the poor around the Church, and since the opening of the Food Pantry over 30,000 people have been provided food. As we completethe 99th year of our parish's existence, we have begun a major restoration program that will see decorated lower walls in the Temple, and the installation of Icons of the life of the Theotokos on the walls of the Temple. 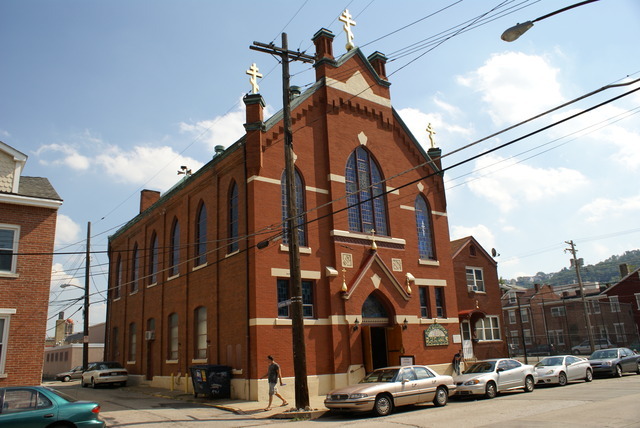 In the course of 100 years of continuous ministry in the Southside of Pittsburgh, SS. 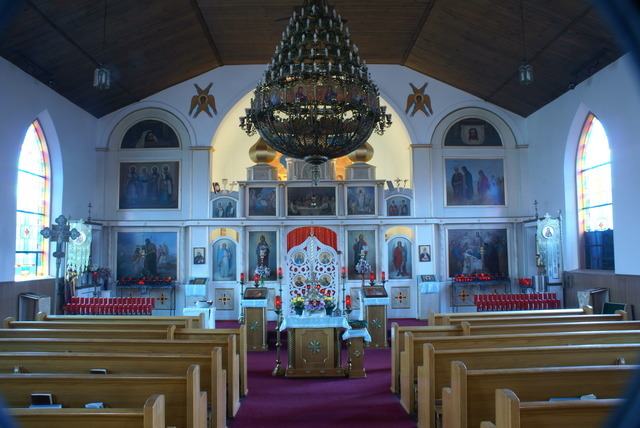 Peter and Paul, now St. Mary Russian Orthodox Church, has remained a vibrant center of holy Orthodoxy, housing the Archdiocesan Religious Education Programs, the Archdiocesan Late Vocations Program for training new deacons, as well as a hub for evangelization and Orthodox Outreach into the community. We look forward to God's continued blesses of fruitfulness in the vineyard for years to come.